The ladies of Weston, Ohio may think Emma Lewis needs a man in her life but this single mom of twin six year old boys has no desire to walk that road again, especially not with the doctor temporarily taking over his uncle's family practice. Yes, he's handsome, was her teenage crush and has been the object of many dreams over the years but he not only doesn't remember her, he storms back into her life by accusing her of being a neglectful mother! Add to that the fact that Emma's scumbag of an ex-husband (a doctor) used her then dumped her the day she told him she was pregnant and is it any wonder Emma doesn't want anything to do with another doctor? Besides, she already has enough on her hands with two mischievous sons, a mother showing early signs of Alzheimer's, two jobs and a house she's renovating herself. She doesn't have time for a man! Burned out from long hours in the ER of a Columbus hospital and the trauma of an abuse case that resulted in a child's death, Clint Preston has come to Weston to take over his uncle's small town medical practice while his aunt and uncle take an extended vacation. He's looking for peace and quiet but when twin boys charge into his office with matching broken wrists and no parent in sight, Clint's radar goes on high alert. He fears another abuse case like the one in Columbus that haunts him but soon comes to realize that the two cases are nothing alike. What he finds instead are two young boys who can't seem to stay out of trouble and their feisty mother who he can't get out of his mind. Far from the neglectful mother he initially accuses her of being, Emma Lewis is a loving mother who simply has two many balls going to keep them all in the air. Circumstances - and two boys - keep bringing Clint and Emma together and gradually their initial animosity thaws and a friendship forms. Eventually, that friendship becomes more but just when it looks like a happy ending might be in their future, the past rears its ugly head. It will take Emma, Clint and a host of family and friends to defeat the threat against Emma and her boys and give them all a chance for a happy ending. With Close to Home, Ferrell kicks off a new contemporary romance series that focuses on the small town of Weston, Ohio and a rich cast of characters. Taking time to develop her characters, Ferrell brings us a hero and heroine who I grew to like and care about. I became invested in them and their relationship. Emma's twins are realistically drawn and an integral part of the story. They and their mother are an unit and I liked that Ferrell portrayed them in that way as well as making the boys the catalyst that brings Emma and Clint together. The suspense element of the story is well written and had me holding my breath, not knowing how it was going to be resolved. It's not a large enough part of the story to classify the book as romantic suspense but provides an added dimension to the final portion of the book. 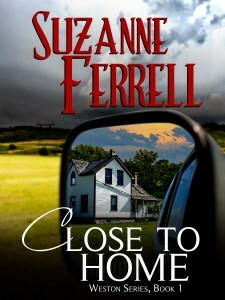 If you're looking for a heartwarming small town romance with a touch of suspense, I highly recommend Close to Home. I enjoyed it immensely and am anticipating a return visit to the town of Weston. I have not gotten this one yet but that is where part of my Christmas gift certificate is going to go. Can't wait. Hope you enjoy it, Dianna. I don't know how many books she has planned for this series but I'm looking forward to each and every visit to Weston, Ohio! PJ, the next book is in the editing stage. Close To The Edge is Gage's story. Some of the same characters are in this book and I hope to have it out sometime in February. I love the sound of this plot and I'm betting it will be a fabulous read! By the way, PJ and Andrea, when I grow up, I want to be able to write reviews just like you do! They're always so great! What a nice compliment. Thank you, Connie! Great review, PJ! I love small-town romances, and I can't wait to read this one. It's already on my Kindle. Now I just have to figure how I can steal time to read it. Janga, let me know if you figure out how to steal that time. I have many books waiting for me to discover how to do that! Great review, PJ. Sounds like just what I'm looking for this week. I just downloaded it to my Nook (awesome price!). Thanks for the review. PJ, thank you so much for the 4&1/2 star review. I'm so glad you liked Close To Home and fell in love with the characters in Weston. They've grown on me and some you haven't met need some love in their lives! This is a story that is on my want to read list. And like everyone else, I need to find more time lol. Love this type of book. Great review, would love to read it. Oh, great review, PJ! Adding it to my list! I do enjoy small town stories. I like the recurring characters, the "smallness" of the scale the setting can take, and the fact that the town itself is often almost a character itself in the story. Thanks for the review. I'll be looking for it. I love small town stories and series books - these books give me the warm and fuzzies. This sounds like my kind of story. I'm definitely adding it to my want to read pile.